Adaptations of great novels can be extremely challenging. Novels and movies are two completely different mediums in which to tell stories. The director must convey visually a concept of a story that is merely suggested at with words. Particularly daunting are the grand epic novels. This is because there is just so much story jam-packed into each page and chapter. Les Miserables is a particularly dense novel with tons of political and emotional overtones with no visual equivalent. No one adaptation of this movie completely shows the moral and political complexities present in the book. Something always falls through the cracks. So why does Hollywood keep on insisting that they should adapt the story? Because once you strip away the complex social ramifications, you still have a very compelling and grand story about the plight of French people. 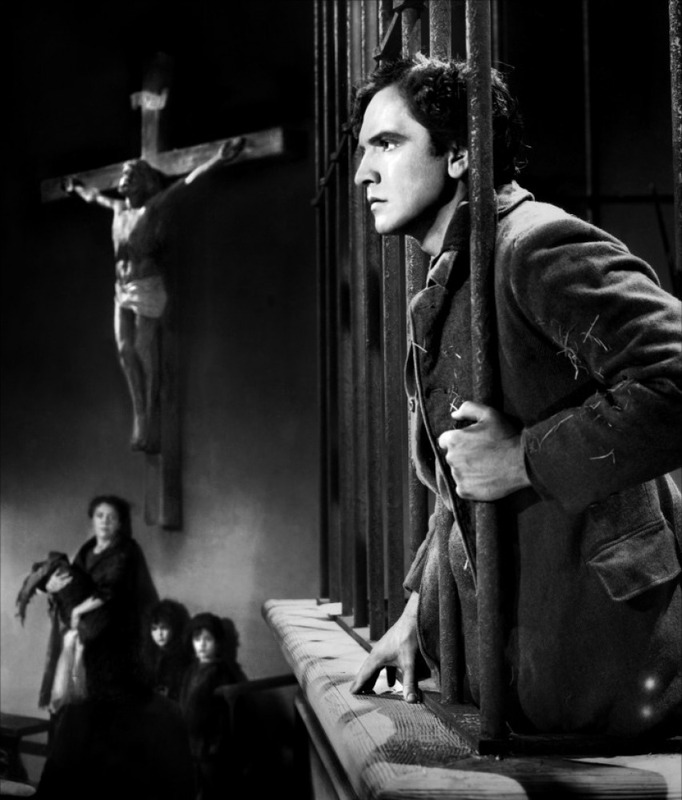 Jean Valjean (Frederic March) is sent to prison for an enormous amount of time because he stole bread to feed his family. While in prison, Valjean subjected to cruel and unusual punishment indicative of this time. He also comes into contact with Inspector Javert (Charles Laughton), a by the book army personnel who divorces himself away from the cruelty going on around him because he is just doing his job. Once Valjean is released, he thrown out onto the streets unable to get a job due to his yellow passport or get shelter. He stumbles upon a priest’s house who takes him in, gives him a warm meal and a warm bed to sleep on. Although Valjean is grateful for the kindness, he must provide for himself so he steals some silver plates and escapes in the night. However he is caught and brought back to the priest, but the priest tells the guards to release him and gives him silver candle sticks along with the silver plates. The priest tells Valjean that he must always give in order to live life properly. Several years pass and Valjean is now Champmatieu, a wealthy factory owner who treats his employees with respect. He is making his way up in the world when one of his ex-employees come knocking at his door. She is pregnant and for that she was fired. Now she is destitute and in danger of miscarriage or sickness. Champmatieu takes her in and she dies while in child-birth. He takes the daughter as his own and raises her with the privilege of his rank. Meanwhile Javert is investigating a disappearance long ago of a convict, Valjean. Javert and Valjean employ a cat and mouse game that involves Valjean renouncing his position and moving to Paris, only to have his daughter fall in love with a student revolutionary. Javert follows closely behind his heels and makes it his duty to catch this man, no matter what. As you can see from the plot, the story is heavy with social and political intrigue and radical ideals. Victor Hugo was never one from hiding his politics and this is no more obvious than in this adaptation where they cut the extensive rebellion scenes and bury the political language and yet still cannot get rid of its inherent message. It is clear: the rich are evil and the poor are saintly. The poor struggle to do what is right while still being able to do what they think is right while the rich do nothing but snub their noses to the plight of the common man. Although this movie is long and includes several things from the book, I thought that they should have added more detail than they did. The story seems to jump willy nilly from one incident to the next. For the middle part of the movie, we completely forget about the young woman about to have a baby, but she reappears again just as she was dying to ask him an important question: will you take proper care of my daughter? The best thing about this movie has got to be the performance of Charles Laughton as Javert. Like everything else, Laughton lights up the screen every time he comes into a movie. Laughton is able to give dimension and depth to Javert, both qualities the screenwriter should have actually written for instead of a robot. Laughton is given very little to work with, but at least it is something. This adaptation of Les Miserables isn’t a bad choice all things considered.